Jan. 28, 2010, 12:01 a.m.
By Laura McGann @lkmcgann Jan. 28, 2010, 12:01 a.m.
For those who think government support of journalism is just something they do in Europe — or that talk of state subsidies are new to this particular downturn — a new report from USC Annenberg is a useful corrective. The study, set to be unveiled today, carefully illustrates that the separation of news and state has never been particularly strong — that for most of American history, journalism has been heavily subsidized by federal and state government. The public support, including tax breaks, postal subsidies and public notice requirements have meant billions for the industry. But the troubles in the news business have coincided with a continued drop in government subsidies. Postal subsidies alone, for example, were worth $1.97 billion in the mid 1960s (in 2009 dollars). Today, those subsidies are worth $288 million — a 75 percent drop. Victor Navasky, longtime publisher of The Nation, reports that a recent postal fee hike hiked the magazine’s mailing costs $500,000 a year, at a time when the magazine was already losing more than $300,000 annually. In 2000, public notices were worth an estimated 5 to 10 percent of community newspaper revenue; now that era is ending, as cash-strapped state and local governments turn to the web to publish themselves. — Avoid the urge to harm the current round of innovations by artificially propping up the old model. — Let innovation run its course, then promote that innovation, as government has done in the past for other technologies. I spoke with Westphal Wednesday when he was on his way to Washington for the report’s unveiling at the National Press Club. Here’s an edited version of our conversation about the report, the relationship between government and the news, and what government should be doing to help the industry. What was the impetus for the study? What made you think to look into government and the news? The obvious underlying factor is the realization that the news business is in search of revenue, a new revenue model — and in search of funding. So we were thinking about the ramifications of that, but we were also thinking about the various ways the news has been funded historically. Geoffrey Cowan is my colleague at USC and former dean at Annenberg and has been interested in this arena for some time, about government’s role historically and currently in funding the news. He thought it would be both interesting to explore that and to just ask the question: Is there a role now for government, just as there have been times in our history from the very beginning? In the report, you refer to a quote from Mizell Stewart III of the Evansville Courier & Press: “Take money from the government? 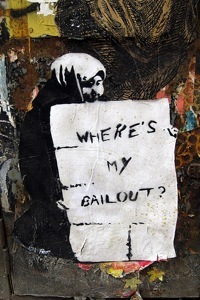 I don’t let anyone else pick up the check.” What do you say to someone who says “no bailout for journalism”? What is your pitch? The idea that government and the press should remain separate is a very, very powerful notion in American culture. It’s a view that’s very widely held. Is that likely to change with this report? No. We don’t expect a massive sea change. We don’t take issue with someone who says, whatever the history has been, I don’t think going forward that the government should be involved. We don’t argue with that. That’s an entirely legitimate position to hold. What we think doesn’t work is to say there has always been a church/state kind of separation between the government and the press. There just hasn’t. In fact, there are interesting ways that the government’s funding of the news plays against some stereotypes. A common statement about government and press is: How can the citizens trust the press to cover government when it’s being partially funded by government? Well, in fact, Americans do trust public broadcasting, which is, in the aggregate, funded 40 percent by government of all kinds, much more than the commercial press, which has less government subsidy. There are, in some ways, what we think of as mythologies abut the relationship between the government and press. To the extent that there can be a re-framing, we think it’ll be in the area of understanding about what our history has been. What was the most interesting historical finding in the report? I think probably, in each case of the areas we studied, it was crystallizing the dimensions of government involvement in fairly specific ways — very specific ways in postal subsidies and state and federal tax breaks, less so for public notices. It’s clear, though, that public notices involve hundreds of millions of dollars — probably in the $1 billion range. You take those three categories and you’re probably pushing $4 billion in various kinds of government support. I was aware of each of these, but I was unaware of the size — the collective size. When we’re adding those three up — I should note, that most of the postal subsidies have gone away — but there was a time when you look at it in today’s dollars that you had in the late ’60s, you had the government putting that amount of money into the commercial news business. At the end of the report you have a list of guidelines. If you were to follow those guidelines yourself, and you were in some policy making capacity, what would you do? To me, the most important of those is number two — it’s innovation. That’s where government has traditionally been the most successful. Often times, it’s been sort of an accident that its success in technology innovation, for example, has had huge implications for the news business. The federal government’s role in creating the Internet would be an example. This was thought of as a university research kind of thing. I doubt if there were ideas at the time that it would have this impact on the commercial news business. Investment in infrastructure, such as the telephone system that the federal government helped build out, especially in rural areas. Inventions such as the satellite technology that has allowed us to have the kind of telecommunications and movement of information that we have today. Those are the areas that government has traditionally played the most helpful role and I think that would be our guiding star in that framework we set out. Photo of graffiti by Wally Gobetz used under a Creative Commons license. POSTED Jan. 28, 2010, 12:01 a.m.
McGann, Laura. "Separation of news and state? How government subsidies buoyed media." Nieman Journalism Lab. Nieman Foundation for Journalism at Harvard, 28 Jan. 2010. Web. 18 Apr. 2019. McGann, Laura. "Separation of news and state? How government subsidies buoyed media." Nieman Journalism Lab. Last modified January 28, 2010. Accessed April 18, 2019. https://www.niemanlab.org/2010/01/separation-of-news-and-state-how-government-subsidies-buoyed-media/.